For decades, much of Betty’s career working for MI-6 and the OSS remained classified. Through access to recently unclassified files, Howard Blum discovers the truth about the attractive blond, codenamed “Cynthia,” who seduced diplomats and military attachés across the globe in exchange for ciphers and secrets; cracked embassy safes to steal codes; and obtained the Polish notebooks that proved key to Alan Turing’s success with Operation Ultra. Beneath Betty’s cool, professional determination, Blum reveals a troubled woman conflicted by the very traits that made her successful: her lack of deep emotional connections and her readiness to risk everything. 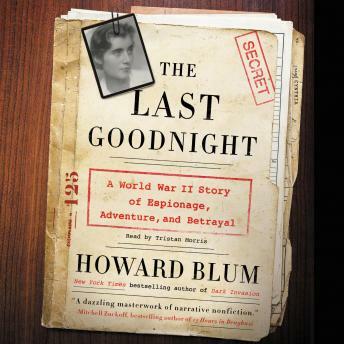 The Last Goodnight is a mesmerizing, provocative, and moving portrait of an exceptional heroine whose undaunted courage helped to save the world.